And then there were two. This morning Sandro wasn't in a hurry to leave. He had already booked a bus from Sahagún to Léon on Saturday afternoon and another overnight bus to Madrid to fly home to Sicily Monday morning. No sure what he is going to do today as he hates going into Sahagún and stay at the albergue with the crowd. Sandro, if you are reading this when you are home, let me know what you did today. We said our goodbye on left the albergue. Maura and me walked the last 19 km passing Arenillas de Valderaduey where we stopped and I ate one of.my bocadillos from last night. Then the walk along the canal where the watering devices drew the water, it was spraying water all over and not able to avoid the extra unwanted shower this morning. Luckily we can time it to reduce the amount of water dropped on us. A beautiful field of spring yellow flowers. This field is probably no in use this year as those flowers are more like weeds announcing the coming of spring. My shoe got caught in an iron hook along the path (who put it there?) and got ripped. It's still functional and maybe I will use the sewing kit later to temporarily patch it. It should last another 7 days or so on the first section of the Camino Mozarabe from Granada to Cordoba after which I will give it a good funeral. 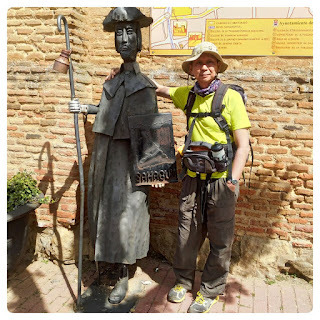 It had serve me well since last year's Camino Vasco and the second leg of the Camino Mozarabe and this year's Camino Madrid. At around 12 pm we entered Sahagún from the south side, a total of 321 km for the Camino del Madrid. First things first, bar for my first coffee, then albergue to stamp the credencial. Solo sellos, stamp only, not to stay. Next, to the train station to get tickets to Léon. For Maura it is to start her Camino de Salvador (Léon to Oviedo) about 4-5 days. For me it's to get to Madrid and then to Granada. The 2 pm train to Léon gives us enough time for have another break. I have a friend that will be walking past Sahagún in two days via Camino Frances, unfortunately we couldn't meet. So to the first church/albergue in Sahagún with the iconic St James statue outside to take a picture, tag him on Facebook. Hope he does the same in two days time. Second break at a nice bar/hostal opposite the statue at the corner. It has a Brazilian flag outside so as expected it is run by a Brazilian couple. More food (Santiago tarta) before leaving for Lèon. The train took only half an hour for what two days of walk? In Léon I got my train tickets for Madrid and Granada. Ticket for Madrid-Granada only leaves in the morning, which means a night in Madrid. On Semana Santa the hostal in Madrid is expensive, even the cheapest is double the price, not that I have a choice. Surprisingly Granada on Saturday is not, go figure. Maybe I will stay two nights in Granada and start my Camino Mozarabe on Monday. Anyway with 3 hours in Léon, I managed to see the cathedral again and help Maura navigate to the Benedictine albergue. We say our goodbyes of course more food before heading back to the train station. All that while navigating my way around the Semana Santa procession that blocks quite a number of roads in the city. 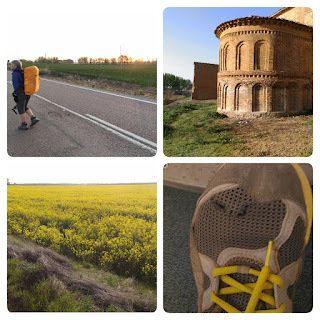 All the memories of my Camino Frances 11 years ago are rushing back, in Sahagún and Léon. I am then went to melgar de arriba (albergue bar), only 6 KM, and I made in the afternoon a long walk to nearby fields ( night in melgar). 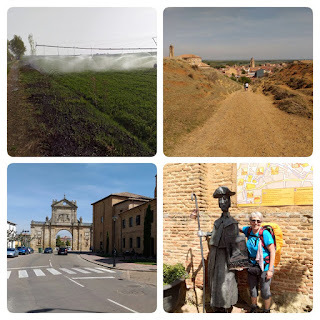 The next day, the last etapa final, I've reached sahagun stopping in Grajal de campos (castle, church, good albergue and bars) and then with a few 3 km more, out the camino, in san pedro de la duenas (the magnificent church and monastery). I will follow the your mozarbe because I have that camino in my mind. I have many things in my heads!